This post is for the people who say you cannot grow cocos nucifera in San Diego, and perhaps in the area of Los Angeles. My climate is a little bit warmer and dryer than those areas, but not too much to make a significant difference. The secret: there is none. It is just common sense. In our region, cocos nucifera must not be planted in the native heavy clay soils, but in deep sand with some organic materials. Add to this a south face location, and you will be fine. These fotos are proof of my 12 year experiment. 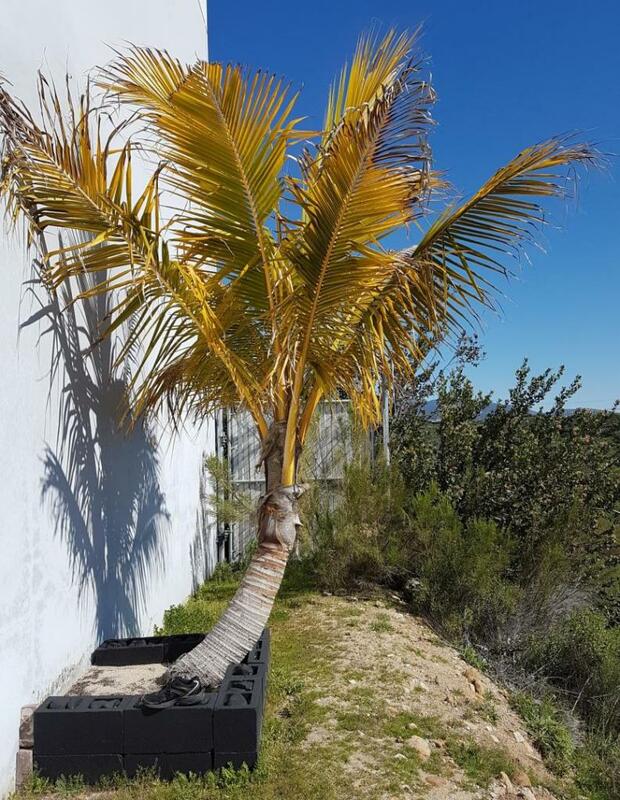 These fotos show the growth of my cocos nucifera planted in my factory in Tijuana, aprox 15 kilometers from the ocean, from when I planted it in 2007 to this day today 7 February 2019. 12 years. It is now a established palm that has experienced all the extended cool and cold temperatures, and heavy rain our region can receive. As you can see, it is planted in about 85% sand and 15% organic materials. It is yellow Maypan - this is what I was told when I bought it. It always has some yellow color, but has more in the cooler months. This yellow disappears every year in April. Now it is between 5 and 6 meters high, and very healthy. I put my shoe in the fotos today for comparison (thank you DoomsDave for this idea). Even now in the last part of winter it is growing new fronds as you can see in the foto, in spite of a cold winter and unusual frequent rain this year. Great to see an update from you! I wonder from time to time how this little Cocos is doing. Not little anymore! I am curious what the coldest temperature is that you have experienced at that location. I hope you will post an update again in the summer so we can see it when it is happy and warm. Thank you for the update!! In these 12 years, has it produced inflorescence? Do you fertilize it? Add salt to it? Fantastic effort mate, you've done really well with your coconut. I'm 32 south so very interested in your results. Good job! Keep us up to date with this one from the factory and the other ones you have! Awesome! It looks a lot like the Newport coconut. Congrats! You have become one with the Coconut! Very cool! 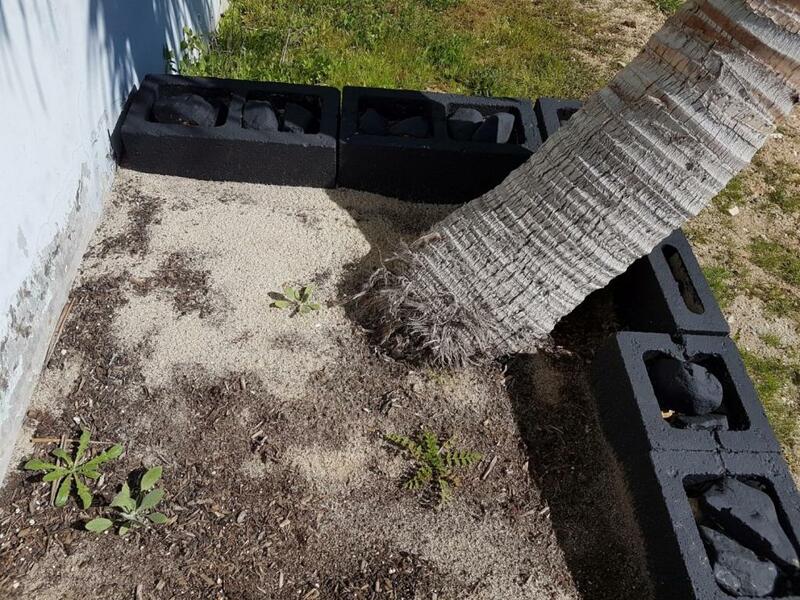 Love how you painted some cinder blocks black to get a little more heat from the sun and to keep the roots warmer into the night. I was wondering how your coconut was going Cristobal. We both started our coconuts at the same time at basically the same distance from the equator. I had to rent my place out and my tenants turned all the reticulation off one summer with disasterous results. My coconut then succumbed that winter. It had about 60 cm of clear trunk. I'm certain if we never moved away it would still be alive and about the size of yours. I learnt that in the growing season they have a high nitrogen requirement as the winter periods virtually put them into a coma. I had a ritual in summer that every second day it would get a 9L bucket of fish and seaweed emulsion plus normal irrigation and weekly npk fertiliser applications. That greens them right up. Its great to see yours still going well. So nice coco ! It's very yellow normally or deficient nutriment ? Does it get watered regularly? How does your palm look by the fall of the year? I would think with good cultural practices (regular watering and application of a quality palm fertilizer) your palm would look great after 6-8 months of more ideal (higher temperatures) weather. 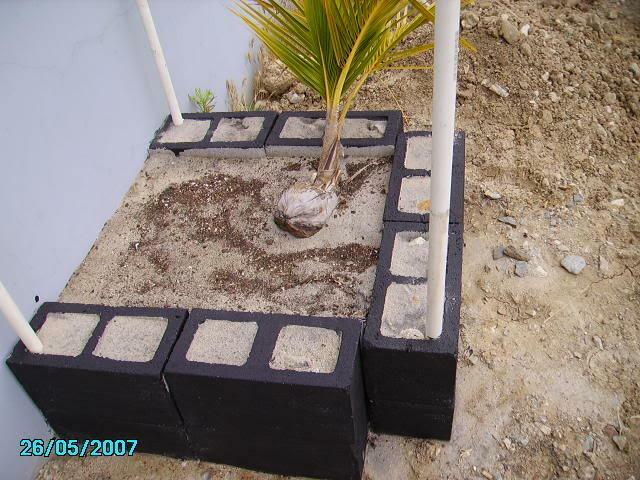 No doubt your planting medium, south exposure and up against a concrete block building, plus the elevation increase of the planting bed, plus the drop off (ground line) out from the building to allow excess winter water to perk down/drain off, away from the palm's roots are big factors in allowing your coconut to survive. 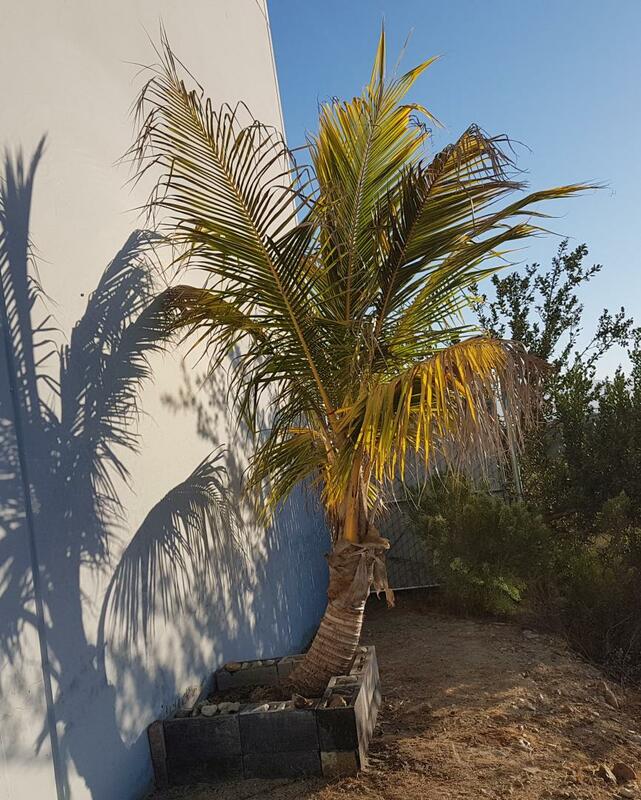 I wondering if you painted the building wall directly behind the coconut a flat black, possibly more wintertime heat would be absorbed into the wall to be radiated back to the palm at night. In any event, your coconut palm as stood the test of a reasonable amount of time. Give us a photo update, say this coming October. I wonder if optimal soil nutrient balance can enable the coco not to be as yellow during cooler weather. I’ve noticed some of my palms get a yellowish tint in the winter as well. I always credited it to reduced photosynthesis since my winter is cool. 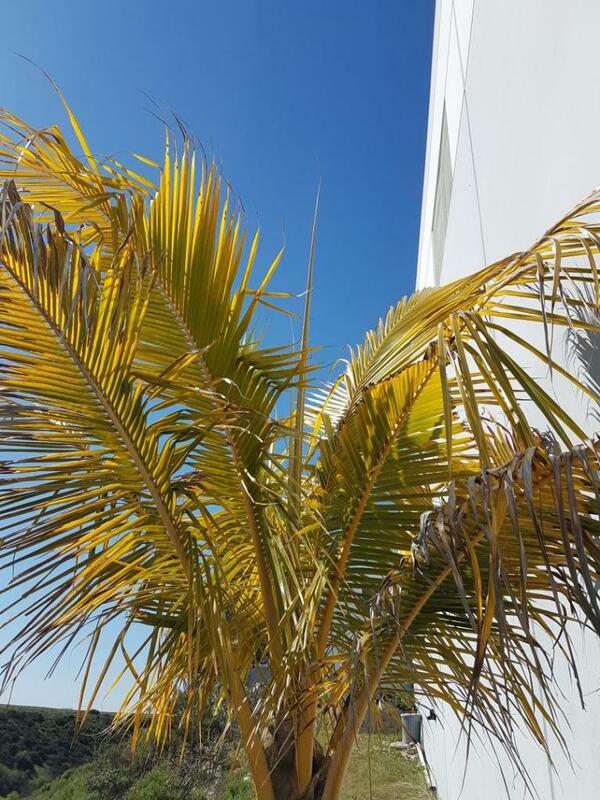 It seems that palms get nutrient deficiencies when they are in climates with cooler winters. I would fertilize it with some quality fertilizer in the Spring, but for where it is it's doing great! I am sure this gives a lot of people in Southern California hope. Good work! Hammer - I do not know what the minimum temperature is for this area every winter, but I am quite sure it is more than 32F. I estimate 3-4C (37 - 40F) is probably the coldest it gets there. It is in a very good location on a mesa at the top of a deep canyon, so all cold air goes down from the location of the palm. My workers have told me they have not seen frost or ice at the factory on the coldest winter mornings, and I have not seen very significant damage from cold in the life of this palm. Cold damage is dark spots. The brown ends on the fronds is damage caused from wind - it can be very windy at times in this area and especially with the Santa Ana winds it has no protection. 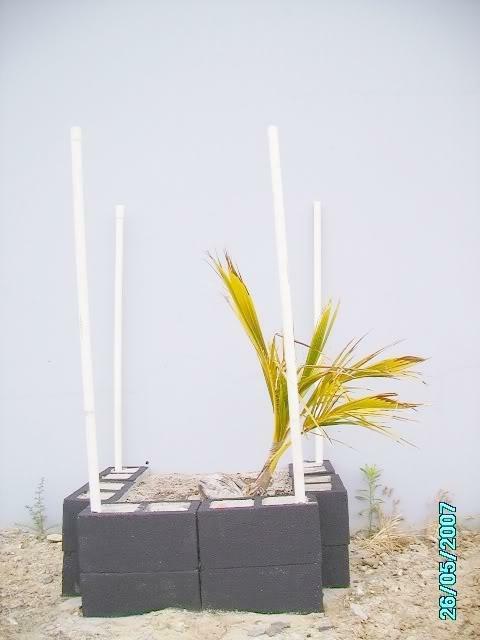 Tyrone - I am sorry to learn about your palm, I remember when you planted it and the growth in the first years. It was doing well, it is too bad the renters did not take good care of it. In the spring I give the cocos some Ironite. GottmitAlex - For fertilizer I give it Jobes organic palm fertilizer, 2 cups every few months all year. Last fall it did start to send a infloresence for the first time, but it dried quickly and died because of Santa Ana winds. I go to the factory perhaps two times a month. In the warmer months I have one of my workers water it. From November to the end of March, I do not give it any water. Walt - I have thought about painting the wall black, but have never done it. I think it is fine as it is for the moment. I really think the sand is what makes the big difference. Almost everywhere in southern california and baja california the soil is very heavy clay. It is called adobe. The Spanish padres made their missions from it and many of these walls still exist hundreds of years later. It is very thick, very hard and just does not drain and dry fast and well. It is like concrete. I made a hole almost 1 meter deep for the sand where it is planted, I am sure it is filled now with roots. In the future, I may dig around the palm to see if roots are going into the native soil. If they are, I may put more sand around the palm. I also thought last year about removing the concrete blocks around it, but I think it may fall over if I do this, so I just leave them there. I really hope for another infloresence this year. I was told this is yellow Maypan. Here is a foto for you from October 2017 at the end of the warm season you can see it is still yellow. I wouldn't remove the blocks, as they absorb heat (like a heat sink) and release the heat over the course of the night. As far as painting the wall behind the coconut flat black, that is probably the least of all beneficial factors. I do believe the sand is the biggest factor -- as you said -- as that allows excess cold water during the winter months to drain away. As for maximum heat, the south block wall exposure is certainly the best exposure your palm can get. I don't know what the analysis is of your organic palm fertilizer, but IMO your coconut sure looks to be suffering from various mineral deficiencies. Have you had the soil pH in the root zone checked and confirmed? I think ideally your soil pH should be around 6.5 so as to most efficiently take up fertilizer nutrients. In my locale (south central Florida) the University of Florida recommends a slow release fertilizer of 8 (nitrogen)-2- phosphorous) 12 (potassium)-4 (magnesium). I'm all but sure it will be a different analysis in your area. You've beaten the odds against a coconut growing in your area. Now the goal should be is to overcome what appears to be mineral deficiencies in the leaves. Here, I can send foliage to the University of Florida (for a nominal fee, of course) to lab test the leaves for what minerals it is lacking. Aside from that, I would definitely get my pH to the point of optimum mineral uptake, and then fertilizer at least four times a year, keeping the soil moist (and minerals in solution for good root uptake) during the warm growing months. In the cold months when soil temperatures drop below 60 degrees I would cut out the water (for the most part) so that the roots aren't too wet. I then may resort to foliage feeding (spraying the leaves) with a liquid solution as per manufacturer's directions. 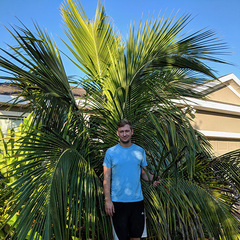 In any event, I vicariously enjoy palm growing experiences like yours, as I'm also a person that accepts the challenges of trying (and succeeding) to grow palms outside my natural growing zone. I can check the ph of the soil the next time I go to the factory. The water here has many minerals it is common to have ph of 7.5 and much more in our soil. I have not ever checked the level of the ph of the soil of the palm so that is very good idea, but I do check frequently the levels of ph with the palms and other plants at my houses, I have the soil laboratory for doing this. I will report when I have done the test. The Jobes organic palm fertilizer I use is N4 P2 K4. I changed to organic fertilizer for all of my plants about 5 years ago, including for this palm.